Friday, November 10th is World Neuroendocrine Tumor (NET) Awareness Day, where those impacted by the disease take to the streets, cafes, medical facilities and, most of all, social media to raise awareness about a relatively unknown disease with an increasingly high incidence rate. Last year, I attended a luncheon hosted by the Healing NET Foundation featuring a popular specialist, Dr. Eric Liu. Up until that point, I had only met one other person in real life with the same disease, so it was pretty neat to be in a whole room of fellow zebras*. While there, I quickly noted that myself and another girl were the youngest people in attendance, so naturally, we gravitated together and exchanged info. Let’s just call her, “That Girl”. Over the past year, we’ve gone on regular lunch dates and supported each other through trying times, both cancer and not cancer related. While our “cases” are completely different we share similar mindsets, aches and pains. BUT, we also have a lot of fun and are both willing to yell “YES” to things outside our comfort zone. For example, at our first lunch, I also told her about First Descents, a group that takes young adult cancer survivors on adventure trips. The next time I saw her, she was signed up to spend a week whitewater kayaking with organization. 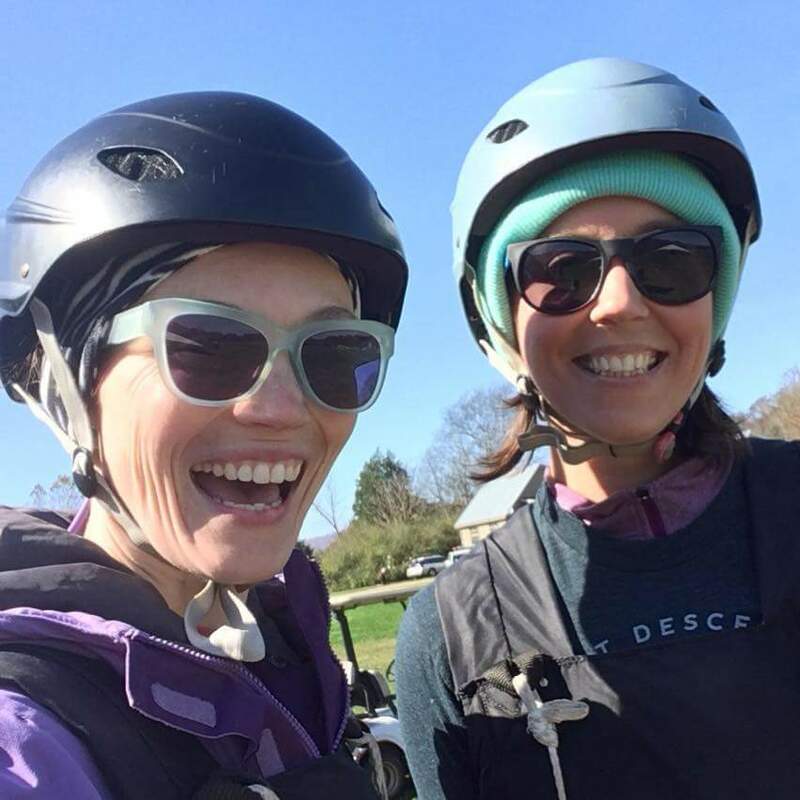 And not only did she embrace kayaking like a badass, but she returned from the week to face some hard, life changing decisions. She’s a fellow dream chaser, giver of zero fucks and is pretty darn inspiring. NET Cancer Day is technically our anniversary, I figured we should do more than lunch. Plus, since we are both First Descent Alumni, we needed to fulfill the “Outliving It” motto. 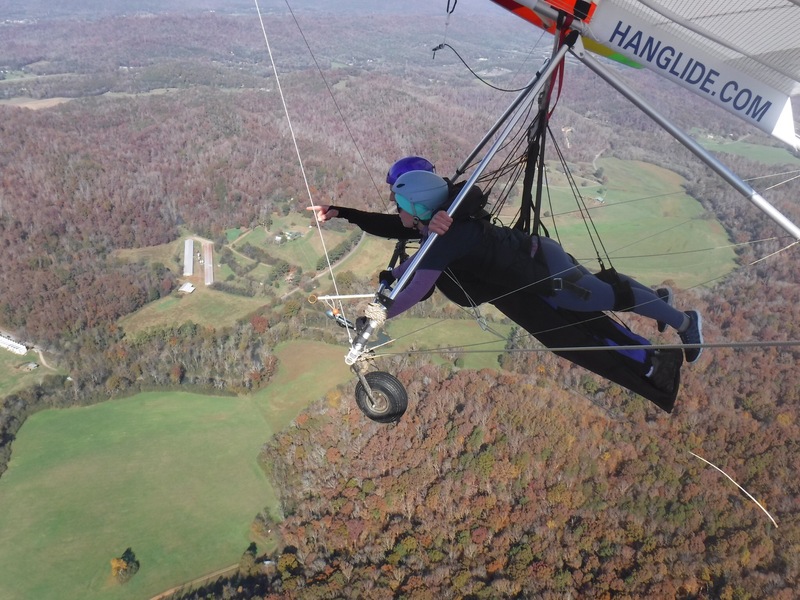 So, with “That Girl’s” signed permission slip of, “if you do it, I will too,” I planned our day, which was a surprise to her until she showed up at my house Friday morning….to go hang gliding. We drove two hours away to Chattanooga, talking, excited, nervous and not knowing what to expect. Upon arrival, we were both relieved I didn’t buy the “run and jump off a mountain” package. Instead a plane pulled the glider from the ground. It was a cold, but beautiful, clear day and we were lucky enough to catch the last weekend of gorgeous fall colors as we sailed through the sky from 2000 ft. above Tennessee, Georgia and Alabama. It was a lot of fun and I would love to do it again. After a lunch of laughs, sandwiches and hot soup, we walked around downtown Chattanooga enjoying the sunshine and city before making a last stop at Pointe Park to watch the sun slide behind the mountain. With both of us content and exhausted, the two hour drive home went fast thanks to podcasts, gummy bears and one of the most gorgeous sunsets I can remember. I hate that I even know NET Cancer Day exists, but love that I got to spend an absolutely perfect day with That Girl. We’re already planning for November 10th, 2018. To learn more about Neuroendocrine Tumors (NETs) visit www.carcinoid.org. Wow, what a great way to spend Worldwide NET Cancer Awareness Day. You and That Girl are fearless! Looks like you had a perfect day! Haha – I don’t know about fearless, but, yes, we did have a perfect day.